Front Fixed Panel: 14" Glass Door: 24" Side Fixed Panel: 32 in. With an integrated design, beauty and functionality the Aston SD908 semi-frameless 36 in. x 36 in. round bypass sliding door shower enclosure is the ideal shower solution. The final touches on this model will complement any renovation - traditional or contemporary. With features including 5mm ANSI-certified premium clear glass, either chrome or stainless steel finish hardware and magnetized door channels, this enclosure portrays beauty and functionality on a budget. This model does not include the matching 2.5 in. low-profile acrylic base. The Davana is a 38 inch x 38 inch neo-angle corner shower kit designed with clean, modern lines and chic hardware. Its reversible door allows for a left or right-hand door opening. As well, the flush mount hinges on the inside glass allow for easy squeegee cleaning. 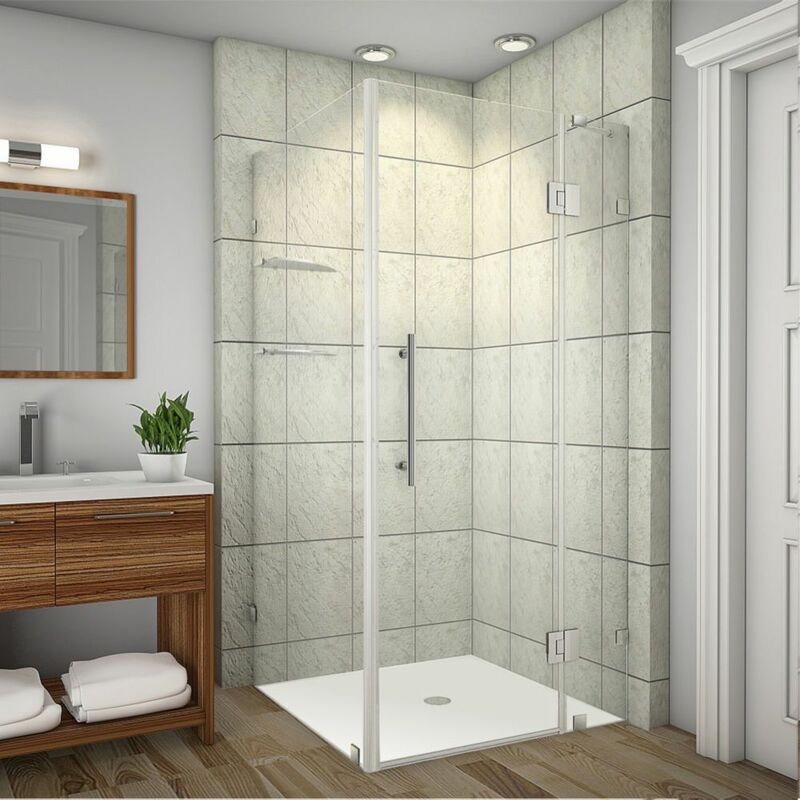 The Davana is a 40 inch x 40 inch neo-angle corner shower kit designed with clean, modern lines and chic hardware. Its reversible door allows for a left or right-hand door opening. As well, the flush mount hinges on the inside glass allow for easy squeegee cleaning. Avalux GS 38-Inch x 32-Inch x 72-Inch Frameless Shower Stall with Glass Shelves in Chrome The Avalux GS completely frameless square/rectangular hinged shower enclosure with glass shelving series provides a contemporary, upscale showering experience in your existing shower space. Available in a number of sizes, the Avalux comes ready to install, complete with 10mm ANSI-certified clear tempered glass, chrome or stainless steel finish with stainless steel composite hardware, Self-Centering hinges, premium clear leak seal strips and engineered for reversible left or right-hand hinged pivot door installation. The GS class includes a two-tier glass shelving system with added convenience and sophistication. This model includes a 5 year warranty; base not included.